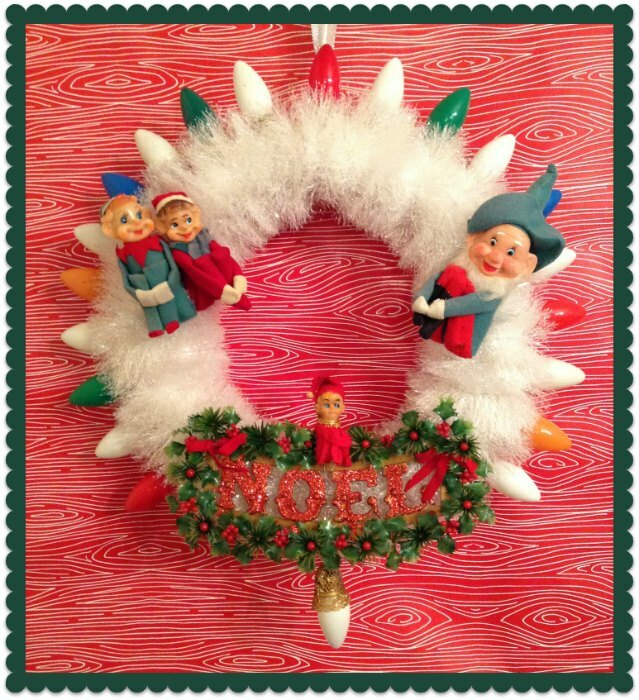 We have a winner in our kneehugger-elf wreath giveaway! Congratulations to Tina, our lucky winner! You’re going to receive the fantabulous wreath that Janeray made herself. It’s awesome. It’s elf-y. It’s getting mailed to your home in a large, very padded box. Please send us a photo of it hanging at your house! Thank you to the 13 others who also commented but didn’t win. We’re honored to have you all as followers and hope you’ll stick around to become friends! Silver bells, silver bells! Or is it Jingle bells, jingle bells? I finally got the nerve to start using my hoard of vintage Christmas ornaments. Here’s a detail of the third wreath I’ve made this week. Our first blog giveaway! 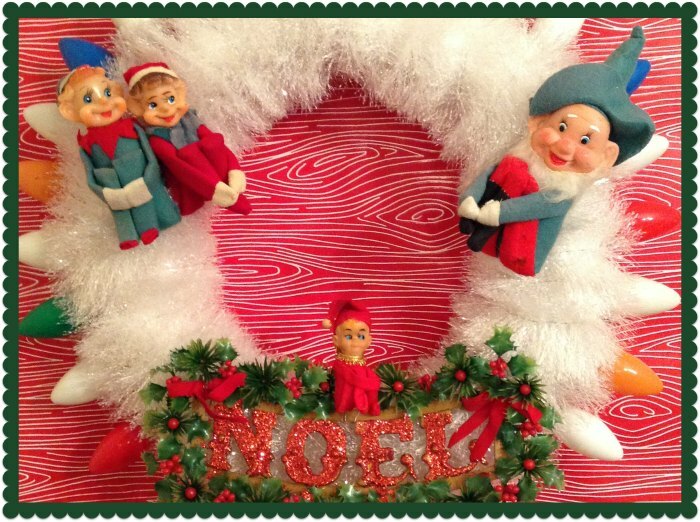 It’s got vintage Christmas elves! We’re so excited about our first blog giveaway! 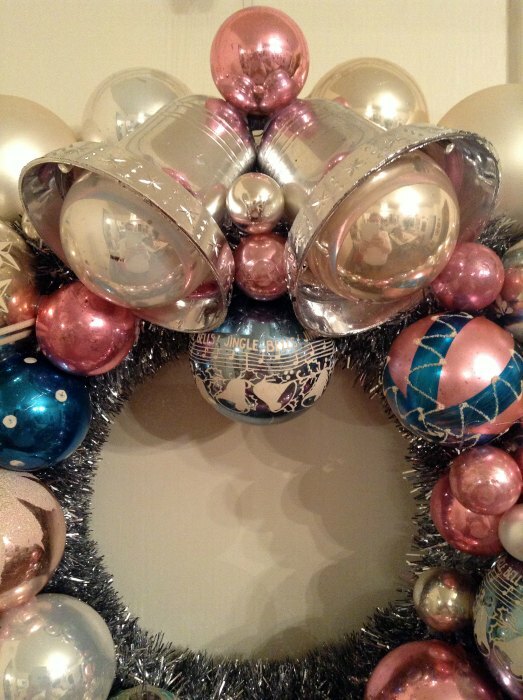 We got out the glue gun and made a wreath with some vintage Christmas goodies. And it could be yours! All yours! Who doesn’t love a Christmas present? One lucky blog reader* will get this wreath to have, to hold, and to re-gift at their annual office white elephant party. All you have to do is tell us why you want to win it in the comments below. And we’d love it if you’d stick around and become a Dish Sisters follower. We’ll use the True Random Generator to pick a winner on Tuesday, December 17th. 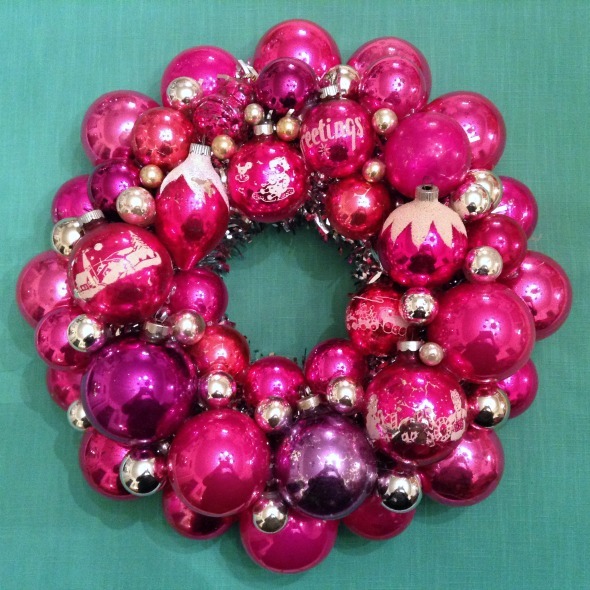 That way the lucky winner will get their new wreath in the mail just in time for Christmas! We’ll announce the winner here after the drawing. Good luck! *We’re limited to readers in the US, unfortunately. Sorry if that leaves you out! Way back on November 18th, Pam over on Retro Renovation posted a tutorial on how to create a vintage Christmas ornament wreath. I was seized with the sudden desire to get in on the fun and make one, too. Yes, I am impulsive. And crazy. I actually made two of these years ago and broke both of them, but that didn’t stop me from hitting every thrift store within reasonable driving distance for the past few weekends. Today I decided to face the music and started organizing my haul.